One 10m x 3m building divided into three rooms creating a garden office, workshop and storage shed by Nordic Rooms. MOSSpods offer several solutions for creating storage alongside their garden rooms. In this case, a separate pod was designed in the same style as the office. This bespoke garden room has an overall height of 2.7m as opposed to the more common 2.5m. It also has a handy integral storage room at the rear. 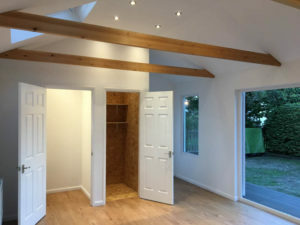 eDEN Garden Rooms have created a second living room for a family in Teddington. The building also incorporates an eco toilet and a discreet storage room. Executive Garden Rooms offer two options for creating garden rooms with storage space, a option where both uses are under one roof or a matching standalone storage area. Extra Rooms & Storage Too! Extra Rooms have created many different style garden room designs with integral stores – on some designs you need to look closely to see the store door!